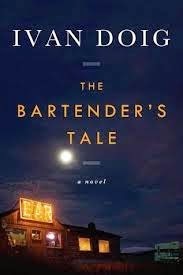 a book chick: "The Bartender's Tale"
my take: When I heard Ivan Doig died (recently), I thought it a fitting time to read this. Sometimes a reading requires a nudge. Set in the early 1960's, this quiet coming of age story really grabbed my interest and heart. Partly it's the tender heart of the bartender and partly going back to a time just before my birth when the world was not the technological wasteland it is now. Ivan Doig is/was known for his Western stories. This one takes place in a small town in Montana and is populated with great characters. I loved the relationship between the bartender and his son. my source: Hubby acquired this in hardcover (no less) ... was on my to read shelf for a long time. I didn't realize that he had died - sounds like I better read it too!